At this point, we realize that ‘The Simpsons’ are wizards and have possibly predicted every big event since the dawn of time, and we’re now just catching on to it. Predicting Donald Trump’s presidency and Fox being bought out by Disney is one thing, but accurately predicting the outcome of the men’s curling final in the Winter Olympics was just downright scary. If their predictions stay on course, then that bodes well for fans of Team Mexico and Team Portugal. Way back in 1997, the popular TV show had an episode titled ‘The Cartridge Family,’ and the two teams that made it to the World Cup was Portugal and Mexico. It must be noted that it did not predict what year it happened, but with the way both teams are playing, it has a feel of being this year. yooo lowkey the simpsons predicted Mexico and Portugal in the final, have they ever been wrong about anything they predict? 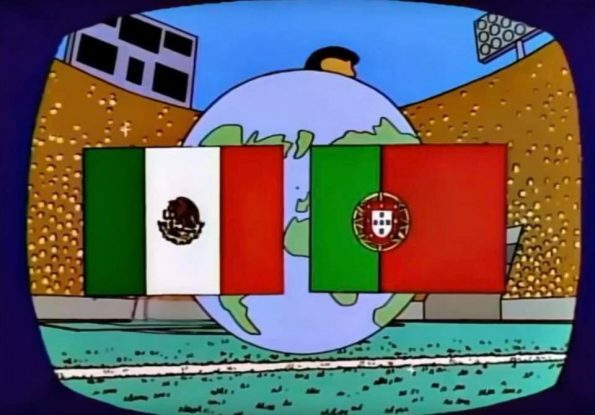 Mexico and Portugal fans are wondering if they’re destined to reach this year’s World Cup final – because of a Simpsons episode from 1997.